“He has got the Midas touch. Anything he touches turns to gold”. Many of us might be familiar with that famous line in the beautiful soul rendition of the ’80s. Well, we are no longer in the ’80s, as someone is replicating the Midas touch once again. But this time around, in the Nigerian Army. The educational landscape in the Nigerian Army has been hit by that Midas touch so much so that lines have been falling in pleasant places. It has never been so good if you ask me and this is why I call the Chief of Army Staff. General Tukur Buratai the man with the Midas touch. I will start with the Nigerian Military School in Zaria. Popularly known as the NMS, whose graduates are often referred to as Ex-boys, an acronym that gained popularity in the country that made the NMS the choice school for most young people. At the NMS, students were tutored alongside military drills. And this was the fun of it all as most parents take pride in telling people their wards are enrolled in the NMS. But like a bang! The then leadership of the Nigerian Army decided to step down full military training for the students, and the NMS lost its glory. But in 2017, that glory was restored with the restoration of full combat training at the Nigerian Military School by the Chief of Army Staff, General Tukur Buratai. This singular act has returned the NMS to its pride of place as a citadel of academic and military excellence. According to insider’s sources, the Chief of Army Staff wondered why combat training would not be a part of a military institution that has produced countless generals in the Nigerian Army. And consequently, he set out to work until he got the presidential nod to reintroduce combat training in the NMS. That is the quintessential Lt. Gen. Tukur Buratai. It didn’t stop there. The famous Command secondary schools of the Nigerian Army across the country were in comatose as a result of neglect by successive administrations in the Nigerian Army. So sad that at some point, the level of infrastructural decay at the various Command Secondary Schools across the country was abysmal. And the schools were a shadow of itself. Some us that knew what it takes to get enrolled at the any of the command schools were disappointed with the level of decay at these once promising military institutions. And again. Lt Gen Tukur Buratai came to the rescue by causing a total transformation of all the Command secondary schools across the country. The transformation was not limited to infrastructures alone, but also in the academics by ensuring an assemblage of highly resourceful teaching staff. The transformation was indeed total as the various command secondary schools across the country are wearing new looks courtesy of the man that places much value on education as well as military combat. In some quarters, the Chief of Army Staff has been quoted as saying that academic excellence should not be elusive in any 21st Century Army, and the Nigerian Army should not be an exception. I am of the opinion that this drive can only be initiated by someone that wants to leave his name in the sands of time because of the invaluable role of education in any given society. So when you have such academic excellence in the various Nigerian Army institutions, the general notion the Nigeria Army is all about “cork and shoot” would be dismissed. And yes, there are could also be intellectuals in the Nigerian Army who would bring their intellectual abilities to bear when needed. This brings me to a very noble one that was also recently introduced by the Chief of Army Staff in the Nigerian Army educational space. Enter the world of the Nigerian Army University Biu which has commenced academic session as a unique and specialized institution that would serve as solutions centre, especially to specific challenges facing the military and North East region. This is a first and another brilliant initiative of the Chief of Army Staff Lt. Gen. Tukur Buratai. Some might wonder why the aggressive drive to improve the educational space of the Nigerian Army. Some might also wonder why Lt. Gen. Tukur Buratai has taken the educational space in the Nigerian Army so seriously to the envy sister services. In my opinion, Lt. Gen Tukur Buratai understands that military education is valuable because it provides an intellectual architecture for battlefield success, contributes to stable civil-military relations, builds a culture of reflection, and a capacity for critical analysis. Military education also helps establish the conditions for military success by creating the intellectual architecture to make military operations more effective, and to do so on a continual basis. And in the words of the Lt. Gen. Tukur Buratai “The university is designed to create the critical mass required for research, innovations, testing, and development of military equipment in the 21st-century setting”. Do I need to say more? It didn’t stop there. The Nigeria Army Depot in Zaria responsible for training recruits into the Nigeria Army was not also left out of the revolution. Its operations have been reshaped to reflect modern realities in warfare. This much can be seen in the quality of recruits coming out of the Nigerian Army Depot. I recall many years back, enlistment into the Nigerian Army as a recruit was a function of proximity to the Nigerian Army depot or a note from a highly placed individual in the country. But not anymore as the enlistment process has been structured in a way that you must meet some specified criteria that would ensure that recruits into the Nigerian Army are not misfits or dullards. And finally, the sponsorship of officers and soldiers of the Nigerian Army for training abroad also received a significant boost under Lt. Gen Tukur Buratai. It can be safely stated that the number of officers and soldiers that have been sponsored for training abroad between 2015 to date is unprecedented in the annals of the Nigerian Army. In some quarters it was stated that the aggressive sponsorship of officers and soldiers for training abroad was as a result of the reluctance of past administration to send officers and soldiers for training. So much so that it affected the operational effectiveness of the service. So when in 2015 Lt. Gen. Tukur Buratai was appointed Chief of Army Staff, he vowed that the issue of training and retraining would be a significant policy drive of the Nigerian Army and he has stayed true to his words. I am quite impressed with the exploits of the Chief of Army Staff in the critical educational sector of the Nigerian Army. It tells the story of a Commander who understands that military education creates the ‘intellectual architecture’ to make military organizations better. And also the fact that military thinking is the link between military education and battlefield success. 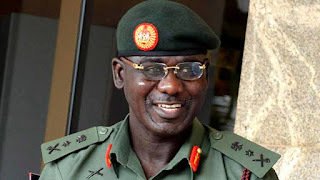 Lt. Gen Tukur Buratai has indeed displayed a hunger for educational excellence in the Nigerian Army which is quite commendable and should be emulated across the board in the security architecture in Nigeria. If that is done, it would not only increase the efficiency of the nation’s security services; it would also equip the various services with the required skills and knowledge in dealing with 21st-century security threats, which are mostly asymmetric. For Lt. Gen Tukur Buratai, I doff my hat for that gentleman with the Midas touch that has been felt in the educational landscape of the Nigerian Army. Agbese is a certified educationist and writes from Aberdeen.